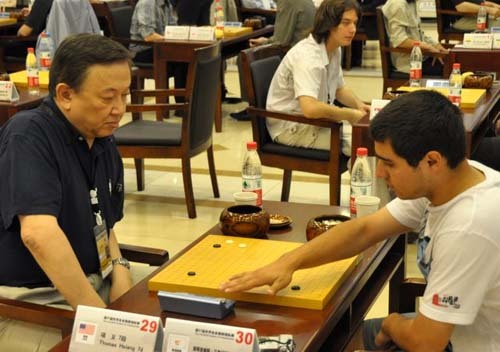 No surprises at the top in the first round of the World Amateur Go Championship, with China, both Koreas and Taipei winning their games handily. 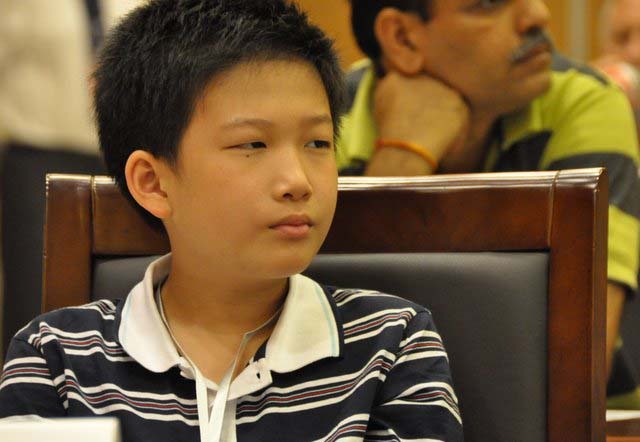 In North America, Thomas Hsiang 7d (US, left) beat Sotirios Ioannides 1k of Cyprus (r), Canada’s Yongfei Ge 7d defeated Alexey Lazarev 6d of Russia and Mexico’s Emil Bustamente 5d beat Janez Janza 3d of Slovenia. 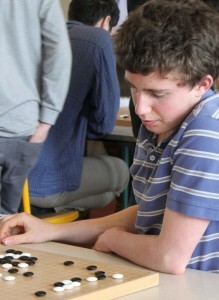 One unexpected result among European players was Thailand’s Kamon Santipojana 4d’s win against Romania’s Lucian Corlan 5d. 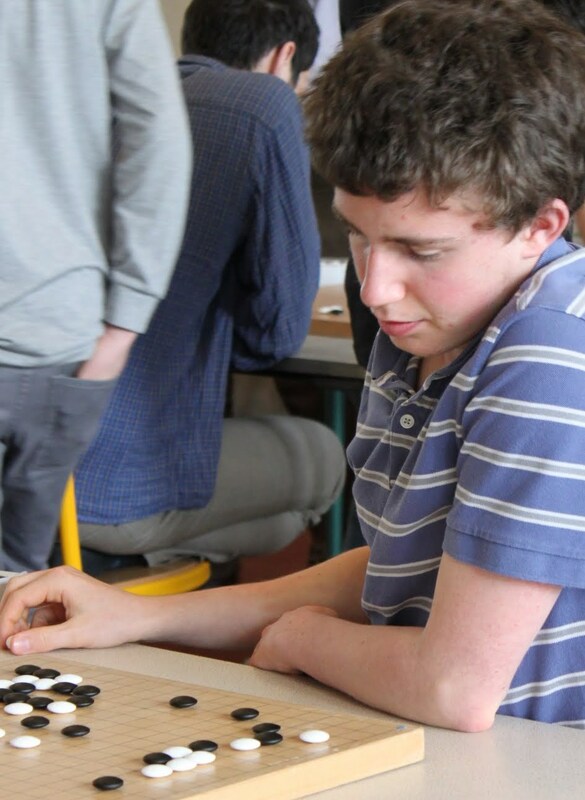 By 6A EST, a complete first-round report – and perhaps a preliminary Round 2 report – will be posted on both the AGA website and Ranka Online. The view of the famous Hangzhou lake district was obscured by haze but all eyes in the 28th-floor suite at the Tian Yuan Tower were riveted on the go board inside. While preparations for the 31st annual World Amateur Go Championships were underway twenty floors below on Monday afternoon, outgoing International Go Federation President Hideo Otake 9P (l) and incoming IGF President Zhenming Chang (r) were enjoying a quiet game (below, with commentary by Michael Redmond 9P) before a busy schedule that included the IGF General meeting, a press conference and the WAGC’s opening ceremonies and banquet. Chang is Vice Chairman and President of the CITIC Group, a major Chinese firm dealing in finance, real estate, resource development, manufacturing and telecommunications. He’s been playing since he was 9 years old. 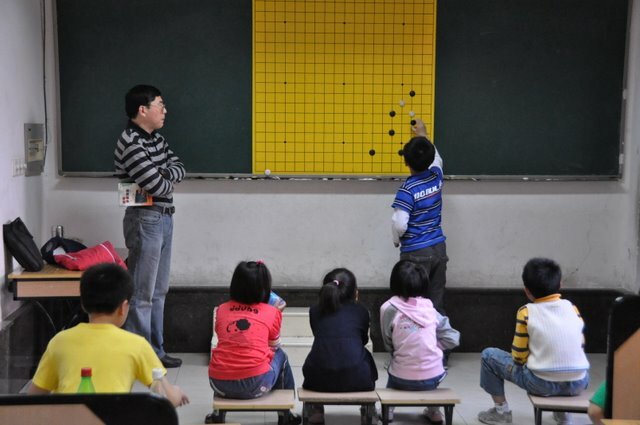 His middle school team was coached by players like Yigang Hua and Runan Wang, and he won the third New Physical Education Cup in 1979, which had previously been won by Weiping Nie and Zude Chen. 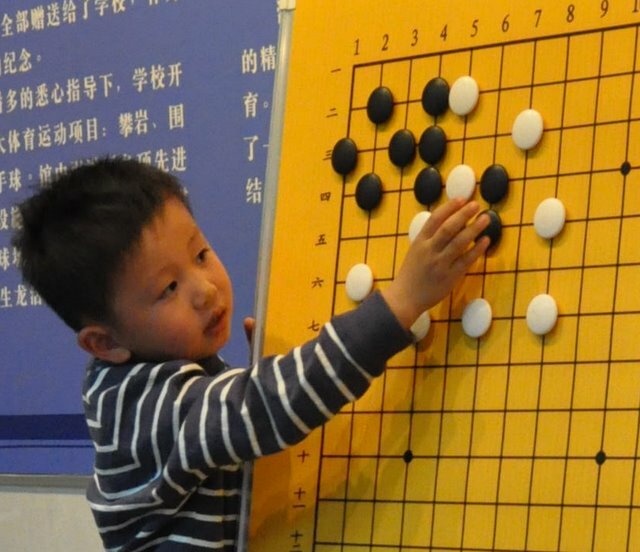 He’s a strong proponent of go because of “it’s great training for the mind, especially for children.” As a businessman, he appreciates the game’s strategic aspects. “You learn that you can lose the battle but win the war. Or in business terms, that you can lose money but still come out ahead. 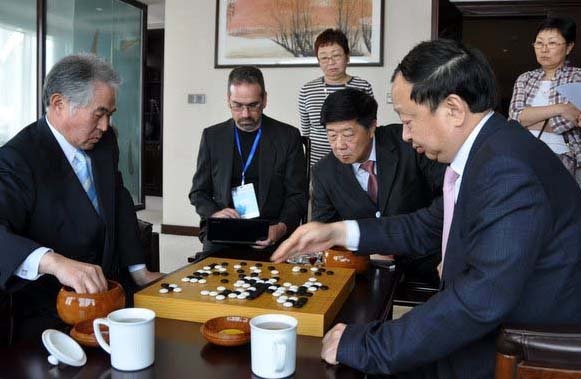 You also learn to adapt to different situations, for example, to use different joseki in different positions.” After the game, the two men briefly discussed a few key points of play, then shook hands and stood up. It was time to turn their attention to other, perhaps less fun, but no less important, aspects of world go. It was a wet afternoon in Tokyo on May 23 when a quiet memorial service was held for the beloved and irrepressible Nakayama Noriyuki-sensei. As the hall at the Okura Hotel filled with Nakayama’s friends, there was time to contemplate the oversize photos showing Nakayama watching the legendary Go Seigen play tournament games. 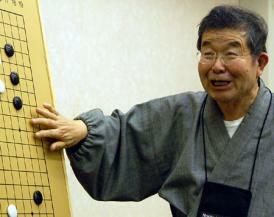 Nakayama’s appearance had not changed much over the years. There was no mistaking the impish smile, the shock of hair. Nakayama’s poetry was also displayed, with each stanza introducing another archaic, almost forgotten character of the ancient Japanese alphabet. In the next room, we paid our respects to Nakayama’s family and to Nakayama while a priest intoned the sutras before Nakayama’s photo, framed in an array of blue and white flowers. We gathered for a meal, after which several people spoke, including Otake Hideo 9P. 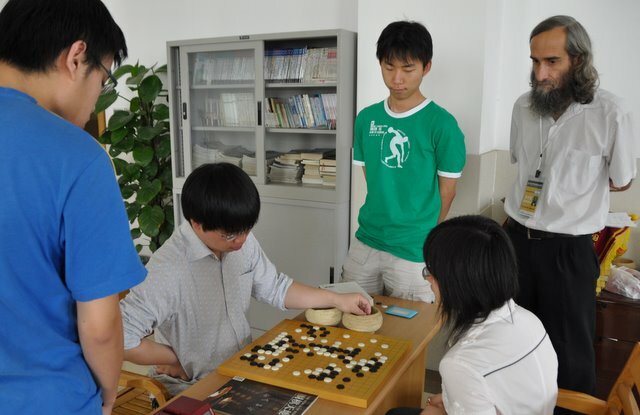 Takemiya Masaki 9P spoke of Nakayama’s many books and how he had been the choice of so many top go professionals as their ghost writer because of his comprehensive knowledge of go as well as his skillful writing. Michael Redmond 9P also spoke, noting that Nakayama had been very popular in the United States, where he was a frequent and longtime visitor at the annual U.S. Go Congress. Nakayama touched many of us with his wit and wisdom, and the memorial service captured the quiet stillness that grounded both. 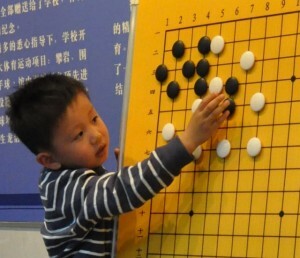 The election of Chang Zhenming of China as President of the International Go Federation (IGF) highlighted the International Go Federation’s General Meeting (r) on Monday as the 31st edition of the IGF’s flagship event – the World Amateur Go Championship – formally launched in Hangzhou, China. 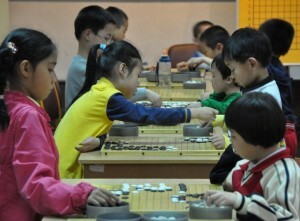 “I will give my best effort to promote go to the whole world,” Chang promised, “Go is a benefit for everyone.” The other major news was that while there have been setbacks in the attempt to achieve recognition for go as an Olympic sport, mind sports are making significant progress. IGF Director Thomas Hsiang reported that the International Olympic Committee (IOC) includes mind sports as a category that has “no realistic chance of entering either the Summer or the Winter Olympics,” and so won’t be recognized. The good news is that SportAccord (formerly the General Association of International Sports Federation, or GAISF) is expanding its definition of sport to include mind sport and plans to sponsor a number of new events, including Mind Sport Games. Planning for a second World Mind Sports Games (WMSG) in August 2012 is now underway, with Manchester UK as the leading candidate to host. In even more exciting news, the International Federation of Poker has applied to become an IMSA and SA member, which has attracted interest from several major marketing firms, with which the IGF is now in discussions. Upcoming events either sponsored by the IGF or with major IGF involvement are the 21st International Pair Go Championships October 16-17 in Japan, the 16th Guangzhou Asian Games November 12-27 and the 32nd World Amateur Go Championship in Shimane, Japan. - Chris Garlock; photo by John Pinkerton. Click here for the complete report and more photos on Ranka Online.